In the United States we say “bread” but across the ocean in Vietnam they say “Banh Mi”. 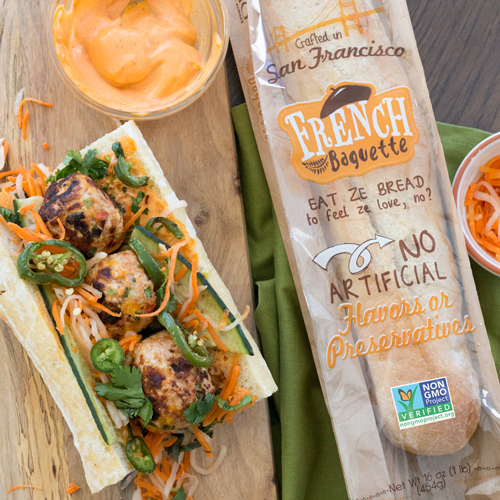 Indulge in Vietnamese culture with these little spicy meatballs perfect for stuffing into our French Baguette which, by the way, is made of 100% authentic Banh Mi. With one bite transport yourself to Vietnam and taste the authentic exotic spices, smell the ocean wafting in off the Mekong Delta and totally immerse yourself in a culture that’s worth experiencing. Preheat oven to 400°F. Make chicken meatballs. In a large bowl, combine ground chicken, jalapeño, onion, red pepper and a tablespoon of Sriracha. Mix thoroughly to distribute ingredients evenly. Form into 3 or 4 meatballs, place on a small baking sheet and bake for 25 minutes. Set aside. 3. Layer meatballs, cilantro, pickled carrots and daikon, cucumber and jalapeño slices inside baguette. Enjoy!